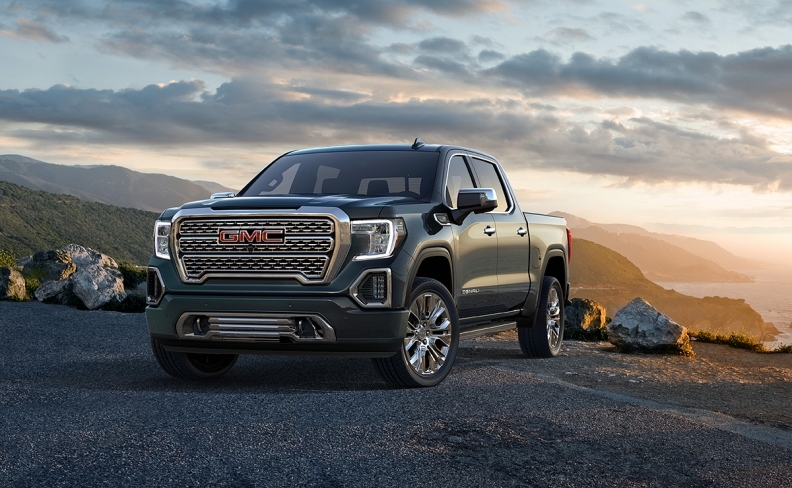 GM executives have promised a greater differentiation than ever before between the 2019 GMC Sierra (pictured) and Silverado. DETROIT -- General Motors is aiming to differentiate the 2019 GMC Sierra from the competition -- and from its Chevy Silverado sibling -- through additional luxury amenities and technologies that the automaker calls segment-leading. It all starts with the tailgate. As the more premium offering from General Motors, the Siera will make its stand against increasingly luxurious versions of the Ford F-150 and Fiat Chrysler's redesigned Ram 1500, which launches this year with major fuel-saving technology upgrades, safety improvements and premium touches. One big weapon for GMC will be the coming forthcoming option of a carbon fibre bed in high-end models. For now, improvements to the redesigned Sierra, aside from a bolder styling and weight reduction of up to 163 kilograms (360 pounds), begin in the rear with a new standard tailgate for its SLT and Denali trims -- both of which are being unveiled Thursday in Detroit. The "MultiPro Tailgate" offers features and multiple positions that allow it to be used as a standing workstation, a step for climbing into and out of the bed or as a seat. It uses "inner" and "primary" gates that are controlled by two buttons in the tailgate handle. In the box, the next-gen pickup appears to have all of the additional features of the Silverado, including a roll-formed, high-strength steel bed; more tie-downs; and an optional 110-volt power outlet. The short-box offers 63 cubic feet of volume, GM said. Later in the model year, the 2019 Sierra Denali will be available with an industry-first carbon fibre composite box that GM is calling the "CarbonPro." It replaces the standard steel inner panels and floor with a lightweight carbon fibre composite that is 28 kilograms (62 pounds) lighter that the steel version. The box is "the toughest and most durable pickup box we have ever made," said Duncan Aldred, vice president of Global GMC, in a release. Without the composite box, the pickup is up to 163 kilograms (360 pounds) lighter than the current model, according to GMC. That's 40 kilograms (90 pounds) less than the difference between the current and next-gen Silverado models, likely because of additional features in the GMC models. The Sierra SLT and Denali trims will come standard with a 5.3-litre V-8 and eight-speed automatic transmission. As with the Silverado, available 6.2-litre V-8 and 3.0-litre inline-six turbodiesel engines will be paired with a 10-speed automatic transmission. GM product boss Mark Reuss previously said the next-gen Silverado would feature six engine options. It's unclear if the redesigned Sierra will offer the same number. GMC didn't provide engine performance details. It also declined to provide information about trims other than the SLT and Denali. The current Sierra also is available in entry-level Sierra and SLE trims with a standard 4.3-litre V-6 engine.